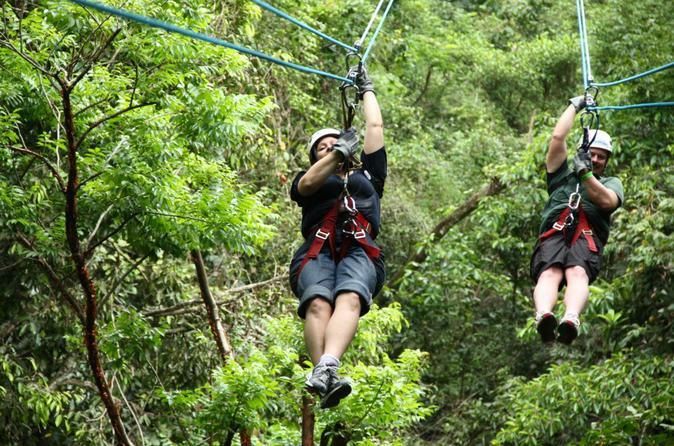 Begin your Ixpanpajul Natural Park Zipline and Eco-Adventure Tour from Flores with pickup from your hotel or airport arrival. A friendly, professional driver will collect you around 8 a.m. for this adrenaline and extreme Flores experience. You’ll make your way through the scenic landscapes of Guatemala and arrive at Ixpanpajul Natural Park, where the Mayan civilization originated. Learn about these ancient people and the numerous species of trees, birds and mammals that call this stunning landscape home. Head out on the towering skyway, where you’ll follow your guide along six suspension bridges that stretch over the jungle canopy. Take a short break in a cozy hammock at Miramas Hill, where you’ll have access to uninterrupted 360-degree views of the Peten jungle. When you’re fully rested and ready for adventure head out on the 1.5-hour canopy tour through the treetops. You’ll shoot around nine platforms in this crossed-cable system that winds through the tallest trees. You’ll fly past colorful birds, stunning landscapes and incredible wildlife on this thrilling adventure that keeps your safety and comfort at the front and center at all times. Before your time in the natural park comes to a close you’ll have the choice of riding a horse or tractor around the plantation before enjoying lunch (at own expense) and free time before making your way back to your hotel around 2:30 pm.